A Baloch National Movement (BNM) leader has presented case of Balochistan to a crowd that included US Congressmen. 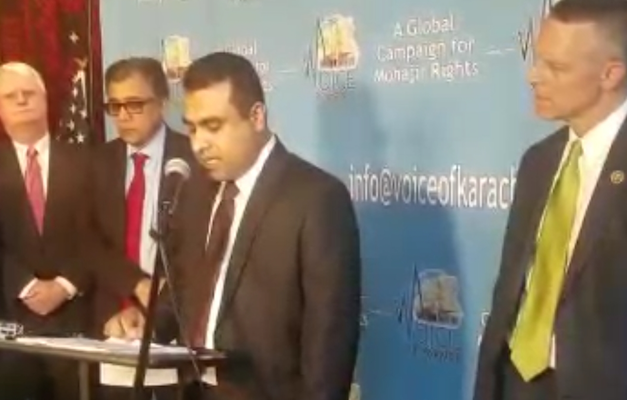 According to details received by The Balochistan Post (TBP), Nabi Baksh Baloch, a member of BNM Foreign Committee, was speaking during an event in US organised by Free Karachi, a group run by former MQM leader Nadeem Nusrat. The event was attended by US Congressmen Scott Perry and Tom Garrett, who also spoke at the event. Mr. Baloch told the US Congressmen that it is incomprehensible that a country like USA which stands for freedom and human dignity continues supporting Pakistan militarily and economically. BNM Leader urged the USA and EU to immediately stop funding and supporting Pakistan. He requested that Pakistan should be declared a state sponsor of terror and sanctions be put against it. A new BRI road map?